The developing Vesper Meadow Restoration Project, is a people-powered ecological rewilding of a degraded wet meadow. Over 120 years of heavy cattle grazing, we will restore these 323 acres of upland meadow on the Dead Indian Plateau. We will be managing for imperiled species, the native plant community, pollinators, and biodiversity – allowing for a science-based rewilding. 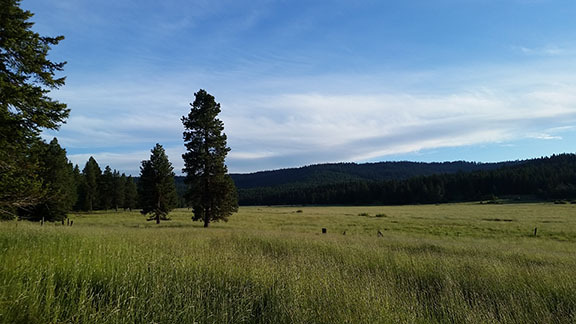 Join us for a scenic meadow walk along Dead Indian Creek, open Ponderosa savannah, and through the Quaking Aspen grove as we collect seed from native grasses, pollinator plants like Buckwheat, Paintbrush, and Bigelow’s sneezeweed. We will also discuss site potential for various restoration goals, including; rare wildlife habitat, riparian shrub restoration, wildcrafting opportunities, beaver habitat….and seek your input for this community powered project! Meet at 8 am at the Northwest Nature Shop in Ashland (154 Oak Street). From there we’ll carpool to the site and arrive at about 8:45 and return to Ashland by 1pm.